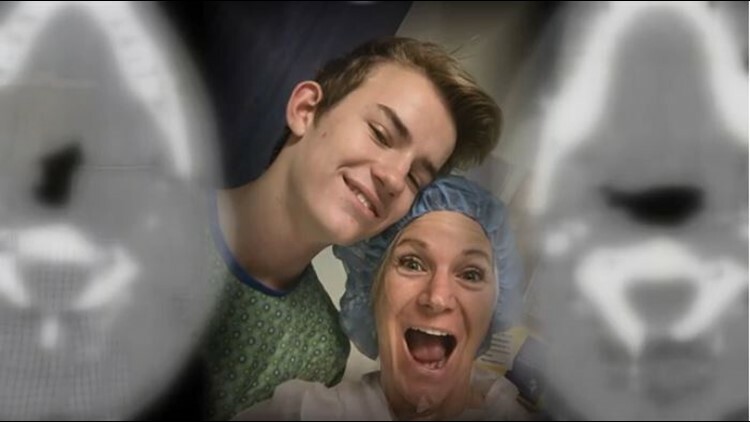 After being diagnosed with a cancer that doubles in size every 25 hours, baseball became a lifeline for one Mullen High School sophomore. Winter in Colorado poses problems for baseball players. With the cold temperatures, there’s no real chance to get outside and field balls. Hitting happens in the cages inside. Even so, dedicated ball players make it happen. If Trey Sieradski can find a positive in a bad diagnosis, at least it happened in the baseball offseason. In November 2017, the Mullen High School sophomore learned he had Burkitt’s Lymphoma, an aggressive cancer that doubles in size every 25 hours. His tumor extended from behind his nasal cavity, down his throat and around his vocal chords, behind his jawline, squeezing his carotid artery, and down into his neck. The tumor was inoperable so the treatment would be aggressive. His dad, Mike Sieradski, said there was no option. "He’s going to fight. We’re going to fight," he said. "We weren’t going to back down, so we were going to win." He asked his mother if he&#39;d ever be&nbsp;his old self again. He was told he wouldn&#39;t - he&#39;d be better. Prayer chains started up. The school community rallied around the family. Friends organized and a group called Friends of Jacyln Foundation offered to make a connection. They introduced the family to the Metro State University baseball team. The coach and team decided to adopt Trey and make him an honorary team member. For three months, Trey and his family lived at Children’s Hospital Colorado, where the treatment was painful, exhausting and frustrating. There were many days when he could barely get out of bed. Someone, he found the way to get up and walk, just walk the halls of the seventh floor. Baseball became a driving force in his recovery. He needed to play this spring. His MSU friends visited and texted him on a daily basis. His mom, Cynthia Sieradski, is so grateful for their friendship. He finished his treatments and February and turned his focus to spring and baseball. He started to hit with the MSU players and work out with the team at Mullen. Despite a brutal winter fighting cancer, Trey returned to the field with his team at Mullen. It was a sight his parents will never forget. You can learn more about Trey’s journey using #TeamUp4Trey. And more about the Friends of Jaclyn Foundation at this link.